Red border day window at 12, revolving hand with red tip for date,numbers 1-31 around dial for date,push button at 2 position for date adjustment Sub second hand,23j movement 6 adjustments (Heat,Cold,Isochronism and 3 positions) Movement is 10BPAD. Cutout rotor forming a "B" 10k gold filled 44mm lug to lug ribbs on case at 12,2,4,6,8 and 10. Does the inside back cover have a stamp mark with a case number (usually four diget)? Nice find and nice watch! interesting, as I think Fifth pointed out elsewhere, ad says "sweep second hand" and ad graphic shows what looks like a sub-second as in subject watch pictures. VERY cool. This is the type I usually look for and can't afford when I find them. '23' Calendar, and the ad doesn't do it justice. My vote is 3 checks for 23 Calander Bulova. I have this watch and just got it back. I had to get my friend and master watch maker to come up with a spacer. I will post this and the Sea King later this week. I'm guessing "Bulova 23 Calendar" is the generic model name, as there were most likely several different model numbers with different characteristics- e.g.. 31337-even if these model numbers were not part of the "model name". two ticks for generic Bulova 23 Calendar. I guess it could have a different unique model name for this bezel, but it's as near to "confirmed" as a record can be w/o a specific matching ad IMO. EDIT- I'll probably change to three ticks... just thinking about being consistent and what confirmed means. three ticks as published.....I'm not finding any "variant" info on the 23 Calendar entries in the Bulova model lists. Would that mean the subject w/ the scallops on bezel is a different model name- I doubt it greatly. New info since my comment above. It looks like "Bulova 23 Calendar" is a model name which eventually has variants. (So subject watch not a Bulova 23 with variant "Calendar"). A few snippets from the price lists. All the "variants" are bracketed by " " in model names. While the eariler two lists don't show any variants for the Bulova 23 Calendar models, they do suggest that full name is the model, not the model and variant. There's only one listed in the 1955 price list. By the 1961 price list, we see two listed. No "variant" designation yet, and the price is the same for both, but we notice two unique Bulova model numbers for the two Bulova 23 Calendar models. 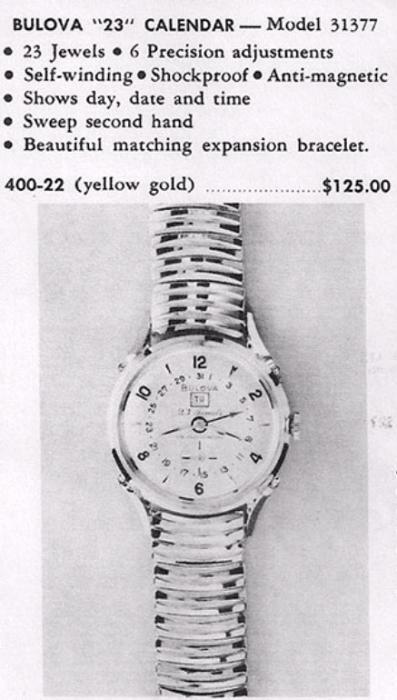 In 1964 price list cumulative section, we see several Bulova 23 Calendars, now with "variant" letters.